God knows "KAUN BANEGA CROREPATI"
Last night while enjoying 3 idiots at Sony Entertainment Channel, I came across the promo of the next season of one of the most successful TV shows, KAUN BANEGA CROREPATI. Once again Mr. Amitabh Bachhan is back with his ‘Lock kiya jae’ to host the fourth season of KBC. I like KBC for 3 things, not just because that it has completed 3 seasons or I was watching 3 idiots, but because there are actually 3 reasons. First, the knowledge part. The game really helps you to check and enhance your knowledge. Second, watching Mr. Amitabh Bachhan is always a delight. Third, of course, the prize money. And it is this third thing, the prize money, the desire to become a crorepati, which compelled me to ask a question from myself – Is this the best way to become a crorepati ? ? ? And then I started looking for answers. When I compared this to other ‘instant recipes of becoming a crorepati’, I realized that this is the most respectable and lawful way of making 10 millions in a such a short span of time. Whatever may be the rate of inflation in India, at any day and for anyone, 10 millions or 1 crore is really something big, something which can actually fulfil their dreams. Now there are two things which stand between you and your dreams – your knowledge and your destiny. You can work on facts and figures, and enhance your knowledge, but what about your destiny? As soon as the first round of registrations for KBC 4 will start from 2nd August, there will be lakhs of people trying their fate and you need to be very lucky for being randomly selected by the computers and reach the next level of the game. But I believe that it is worth giving a chance, after all when we were in our schools and colleges, we used to pay for giving answers and here we will be paid for giving answers. Great, isn’t it. Further , KBC also gives us enormous returns on investment. You can’t think of investing less than lakhs of rupees for earning 1 crore in such a short span of time. Now compare this to those few rupees which you need to spend or say invest each day for dialling the KBC numbers and giving the correct answer. In the first situation the probability of making a crore is very high and in the second, extremely low . But is there any harm in testing your destiny? We all have been reading for years ‘fortune favours the brave’. So, this time, be brave and try your luck,who knows, you may be the next crorepati. If you win, boast about your intellect and if you don’t, simply put the blame on your destiny, as everyone does. And even if you don’t win(read earn) 1 crore , enjoy Mr. Bachhan , his questions and the commercial breaks. This may be fastest way of becoming a crorepati in a lawful manner, but not the only way. So, if luck is not on your side this season, don’t be disheartened because you always have the option of making planned and disciplined investments, reaping the benefits and fulfilling your dreams. For us, the key question should be “KAISE BANENGE CROREPATI” and not “KAUN BANEGA CROREPATI”, and for answers to this question, keep following MONEY MATTERS. Disclaimer : I am neither the brand ambassador nor an agent of Kaun Banega Crorepati. 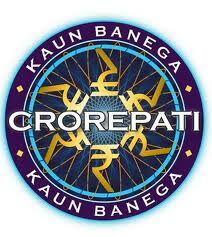 6 Respones to "God knows "KAUN BANEGA CROREPATI""
Really Nice Blog and Very Good predictions and Equity Tips. I liked your blog and I would recommend it to my friends who do trading in Share Market Tips. Thanks a ton for ur valuable comment. and thanks for recommending it to your friends. Buddy, u won't believe, in the first season of KBC, I became a notional crorepati while sitting at my home, knew all the answers, my bad luck though, was only 13 then ! !